Posted on January 17th, by Dr Rob Yeung . All of the students rated the difficulty of the task on a scale of 0 (no difficulty) to 10 (extremely difficult). On average, students in the slumped posture rated the mathematics test as significantly more difficult (6.2) than those who assumed the upright posture (4.9). That may not seem like a massive difference. But it was a measurable difference for something that essentially takes almost no effort to do. In a second study, University of Auckland researchers led by Shwetha Nair asked participants to give an impromtu talk. Lots of people fear public speaking, so you can probably appreciate that most of the participants were quite nervous about having to give a talk. In this study, Nair’s team found that participants who were instructed to sit upright experienced less fear and better mood compared to people who sat in a slumped fashion. These (and other) studies strongly suggest that we can help ourselves in all sorts of way simply by monitoring and improving our postures. Standing and sitting upright can boost mood, improve emotional recovery and lift our mental performance. For example, I have known for many years that my posture in my home office can end up slumping forwards. But I found that (personally for me), changing my chair worked wonders. 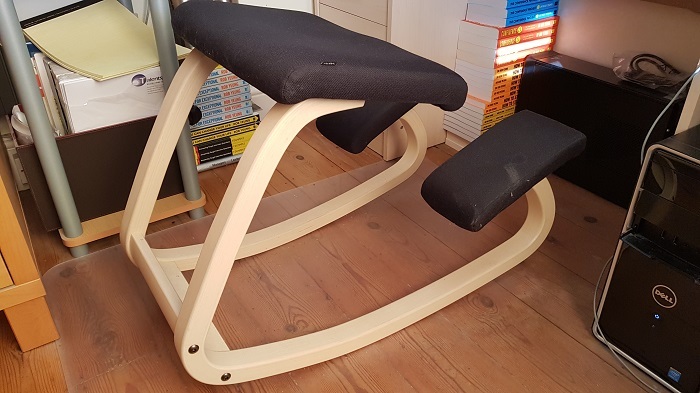 I now sit at a backless rocking stool/chair, which forces me to activate my back muscles and keep my back straight. So how about you? What’s your posture like right at this very moment?